But there are ways to manage and alleviate stress. Take a break and schedule the most helpful spa treatment for the specific type of stress you are facing. Try an aromatherapy massage with lavender, which is thought to reduce the negative effects of stress hormones such as cortisol. Thermotherapy, such as steam or sauna, is a heat therapy that causes your body temperature to rise. Your body recognizes this increased temperature as fever and responds by producing more white blood cells, which in turn boost your immune system. Thermotherapy reduces adrenaline and increases endorphin levels, too, so they are also good for your mental health. These can be reduced through stretching and massage. Choose a day spa that offers massage which includes stretching. Massage for insomnia, sometimes combined with aromatherapy, helps your body decompress and relax into slumber. There are also spas that offer homeopathic options to use at home. Schedule a relaxing manicure and throw in a pedicure, too. Massage that focuses on the neck, shoulders and head will decrease the discomfort and pain of tension and migraine headaches. Reserve a facial to nourish and repair your skin or a full-body exfoliation that will leave you feeling relaxed and silky. Or go in for a makeup lesson and application. Massage increases your level of serotonin, the hormone that makes you happy and causes you to have a positive outlook. And smelling a fragrance during an aromatherapy treatment causes your olfactory receptors to send a message to your limbic system, which deals with your instincts, moods and emotions. People have used hot stone therapy since ancient times. Usually, heated basalt river rocks are used because they retain heat and are smooth. They warm, relax and soothe aching muscles. Don’t let stress get the best of you. We offer solutions to help you! 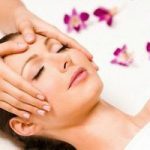 Contact us at www.mysanctuaryspasalon.com or call us at 302-475-1469 for a personalized consultation!